Bras is one of the iconic restaurants of France, set up by Michel Bras in 1992. 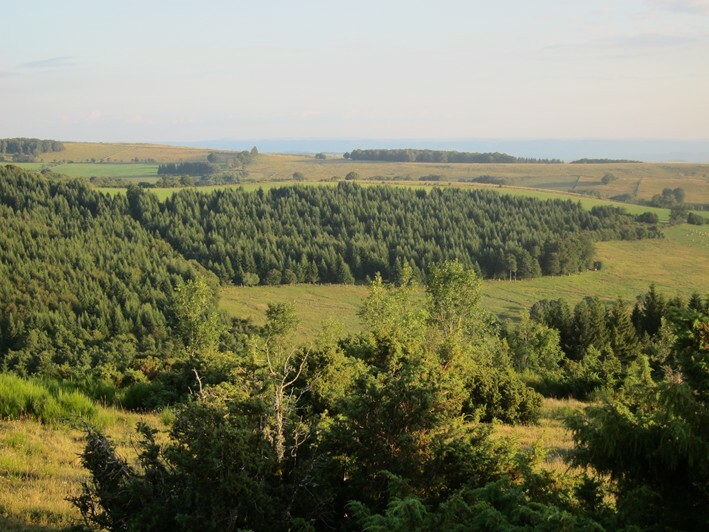 Mr Bras’ family had a hotel restaurant called Lou Mazuc in the Aubrac region of France, and in 1979, when Michel was 33 years old, he inherited this from his parents. He gained two Michelin stars before opening the current restaurant 13 years later on a hillside in Aubrac, near the village of Laguiole, which incidentally is famed for its custom made kitchen knives. By 1999 Bras had gained three Michelin stars, and over time the lead role in the kitchen started to gradually to transition to Michel’s son, Sebastian, who is now the head chef. 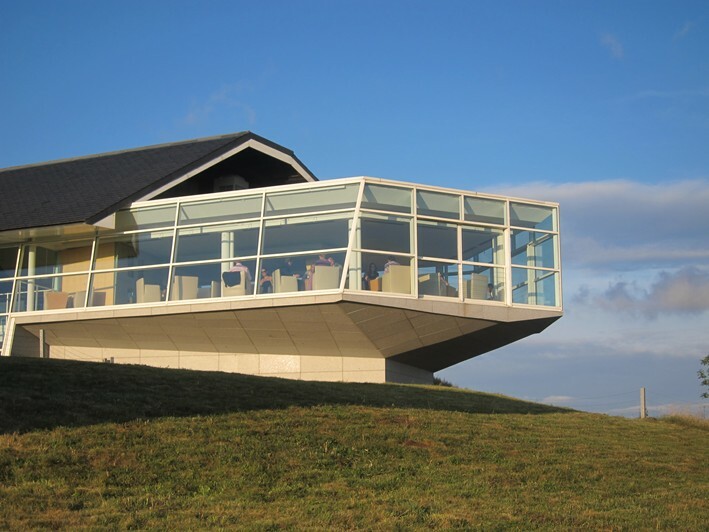 There is also a sister restaurant Bras on Lake Toya in Hokkaido, which was opened in 2002. 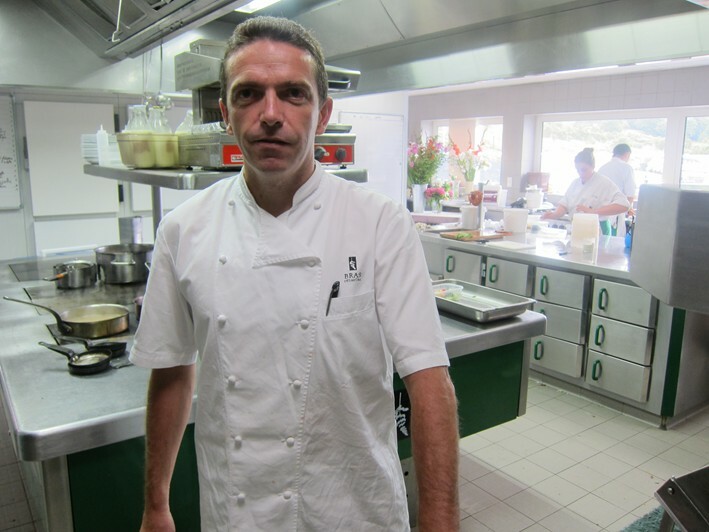 Michel Bras was in 2016 voted the most influential chef in the world by a panel of 530 chefs globally who have held at least two Michelin stars. He is known for inventing a dish called the chocolate coulant, of which more anon, but his best known dish is his gargouillou. 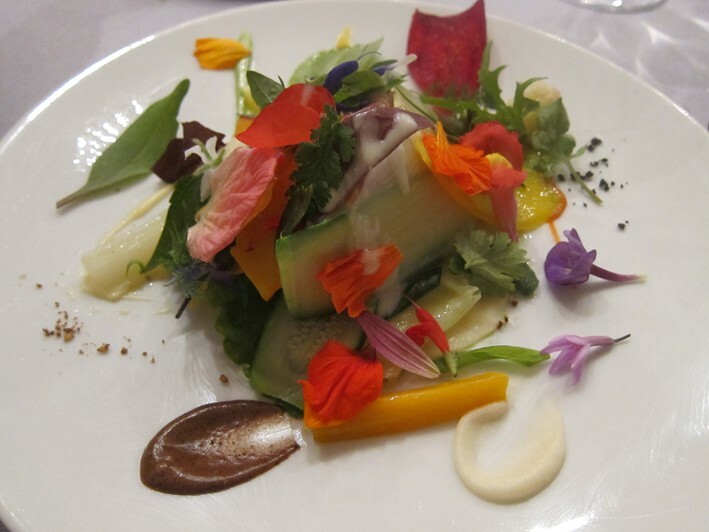 This is a complex assembly of vegetables, herbs, grains, leaves and flowers. The number of components varies by the season and even by the day, but frequently has 50-80 separate elements. 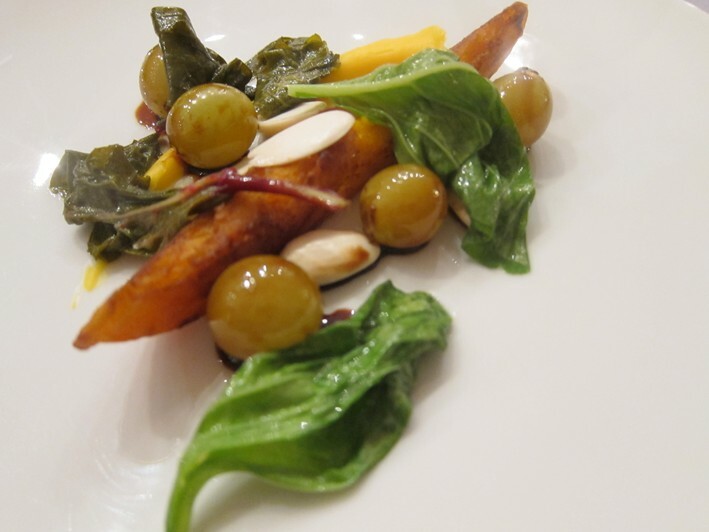 Some are raw, some are pickled, some are cooked, but the key is that the different elements are each prepared separately; this is not a simple salad. There is a solitary piece of ham tucked away at the centre of presentation, the idea being that the ham gives additional flavour when it is cooked together with the vegetables. 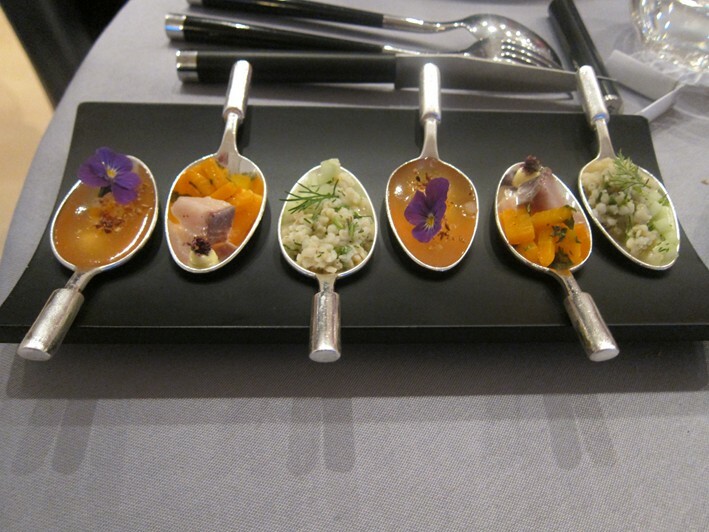 Each morning seven chefs work for hours to create the dish, which appears on each of the Bras menus. 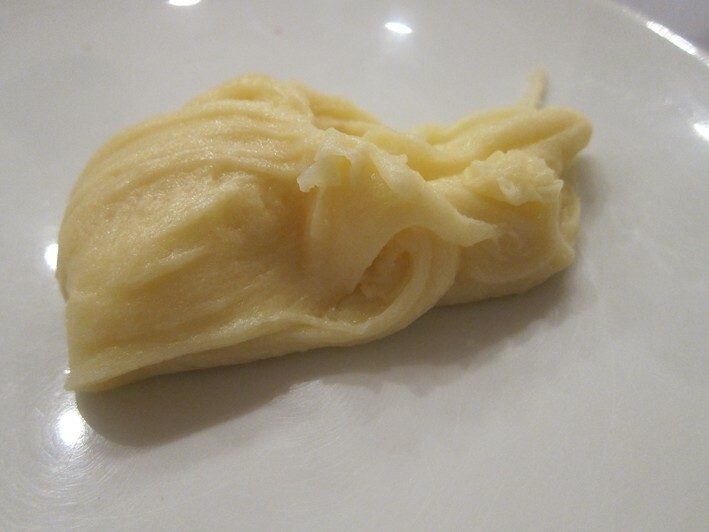 It is the most copied dish I have ever encountered; I have eaten some kind of variation of it or homage to it in the USA, Europe and Japan in assorted restaurants. 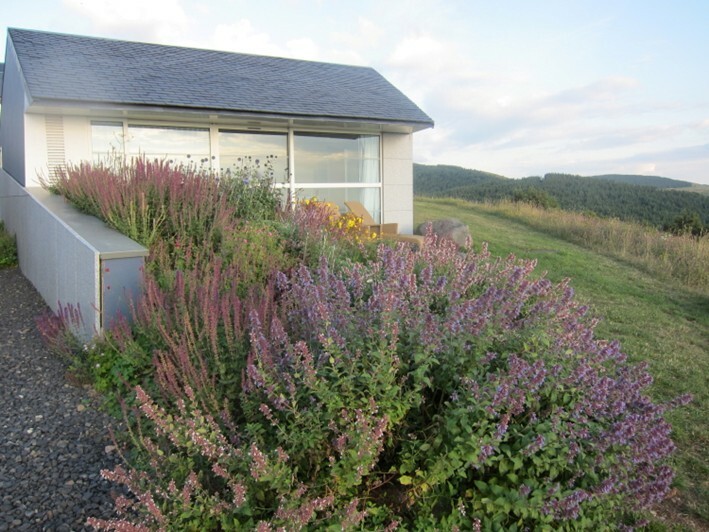 Bras is in a striking modern building that for me resembles a spacecraft that has landed on the top of this remote hillside. 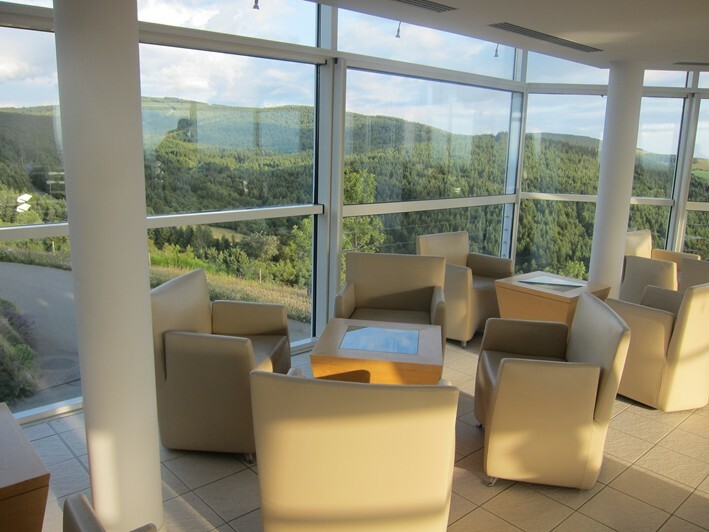 There is a spectacular observation lounge area jutting out into space, with picture windows all around and a fine view over the countryside. There are also a series of bedrooms, which is just as well since there is not much in the way of accommodation nearby, and the locals exploit this. If you stay in nearby Laguiole, just 3 miles (5 km) away then the solitary local taxi firm charges an eye-watering €90 to take you the short journey to the restaurant. Just getting to the restaurant requires considerable planning, as it is one of the toughest reservations in France to get, and Laguiole is in the middle of nowhere in terms of transportation, in the middle of the massif central in the south of France. From Toulouse airport it is 128 miles (206 km) of frequently winding roads that Google Maps optimistically reckons takes two and a half hours by car. 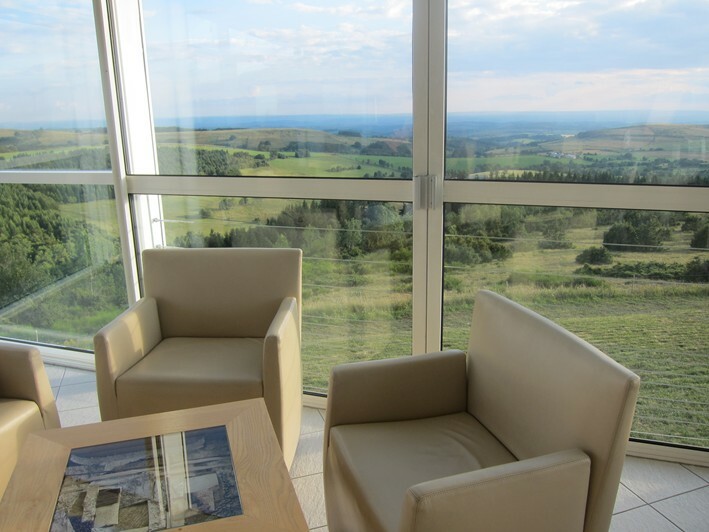 As compensation you get to drive past some stunning countryside and will cross the Millau Viaduct bridge, the tallest bridge in the world and a remarkable sight in itself. 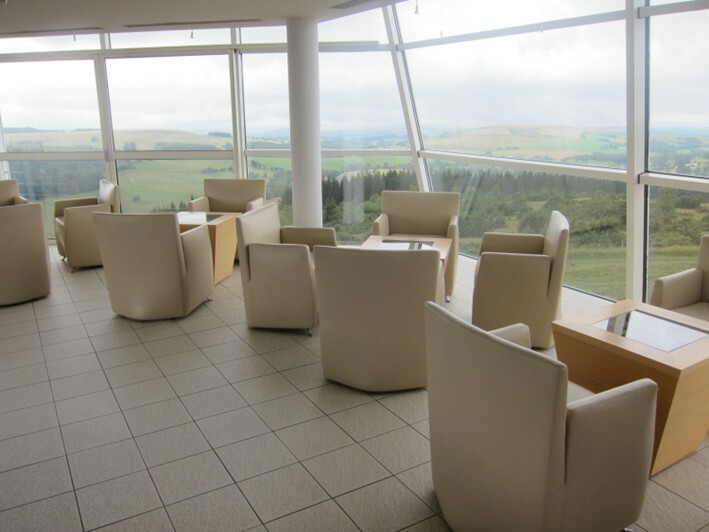 The dining room is stretched out along one wall of the building, so that pretty much all the tables have a view out over the countryside. 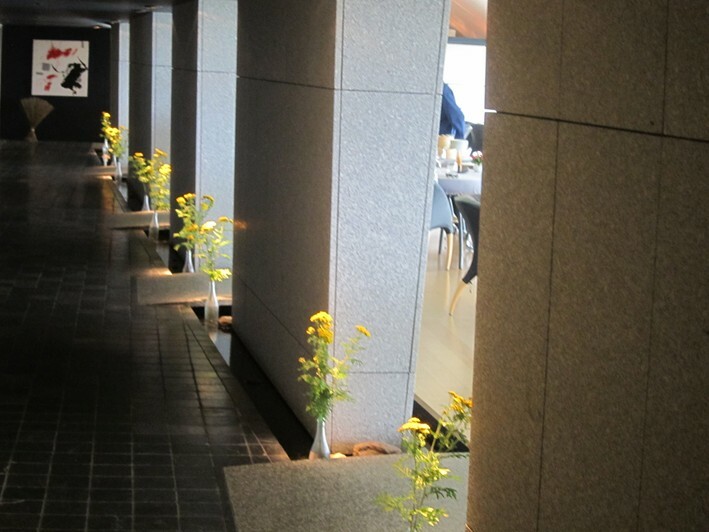 There is a little stream running along the corridor that adjoins the dining room, and tables are large and well spaced. 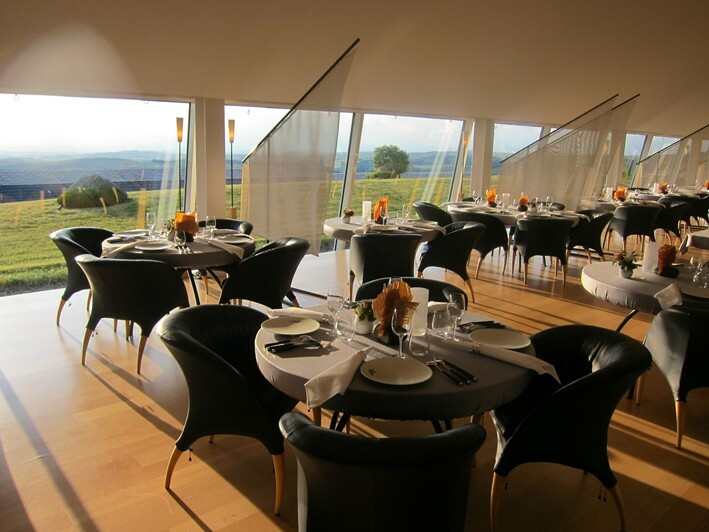 There are three tasting menus available, at €143 (£126), €175 (£154) and €227 (£200), including a fully vegetarian menu at €175 (£155). We opted for the lengthiest one, with one person trying the vegetarian menu for contrast. The extensive wine list was primarily but not exclusively French, and ranged in price from €45 to €8,950. Examples were Granier Vignes Oublier Autour du Cinsault 2012 at €65 for a bottle that you can find in the high street for about €16, Zuccardi Emma Bonarda 2013 at €95 compared to its retail price of €29, and Jacques Carillon Puligny Montrachet 2013 at €150 for a label that will set you back €49 in a shop. At the prestige end of the list, the mark-ups vary significantly but there quite a few relative bargains, such as Leflaive Batard Montrachet 1999 at €450 compared to its current retail price of €638, and Hermitage Chave Cuvee Cathelin 1998 at €1,500 for a wine that has a current market value of €5,048. Oddly, the 1995 is priced the same at €1,500, yet this vintage currently fetches €4,035 in a shop. Even the priciest wine on the list, the Romanee Conti 1998 at €8,950, is actually much less than its current market price of €16,585. Nicely, there were a decent number of wines at €45 for those with normal financial means. As we read the menus we were presented with some excellent toasted almonds and delicate grissini. 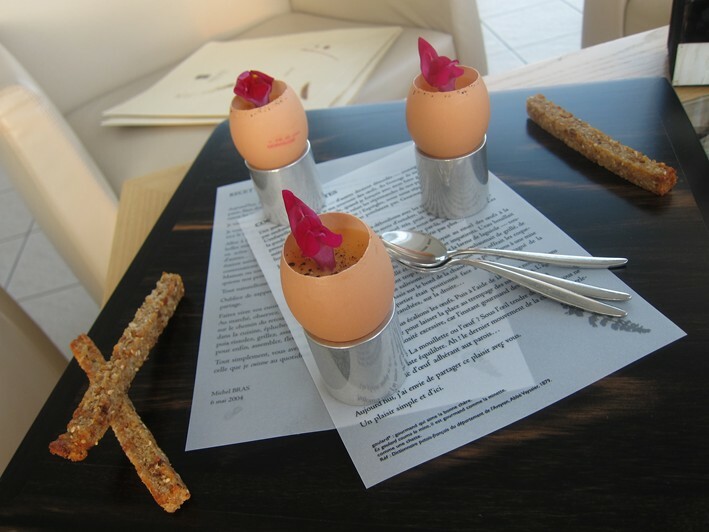 The first amuse bouche was a take on “egg with soldiers”. It had an egg shell which contained an egg custard with courgette, mint, a local oil and a flower that had a vaguely oyster like taste, and some vinegar for balance. This came with a couple of toasted bread fingers to dip in the egg, one flavoured with cumin and the other with a mustard and bean filling. I really liked this, especially the mustard-filled one, which was remarkably delicate (19/20). I really like kitchens that bake their own bread, and the bread here is made from scratch, as was clearly shown when a loaf arrived with my name baked into it. This was a nice personal touch, and the bread itself was lovely, with an excellent crust (19/20). At this stage a trio of nibbles arrived. Aubergine was braised and poached with young sheep cheese and basil. 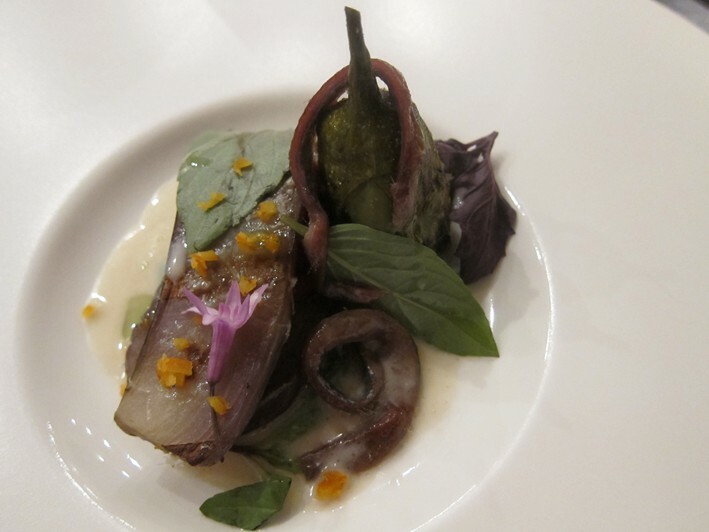 The basil was in some way the star element, having terrific flavour, but though pleasant the aubergine was good rather than remarkable; I have certainly had better aubergine in Japan. 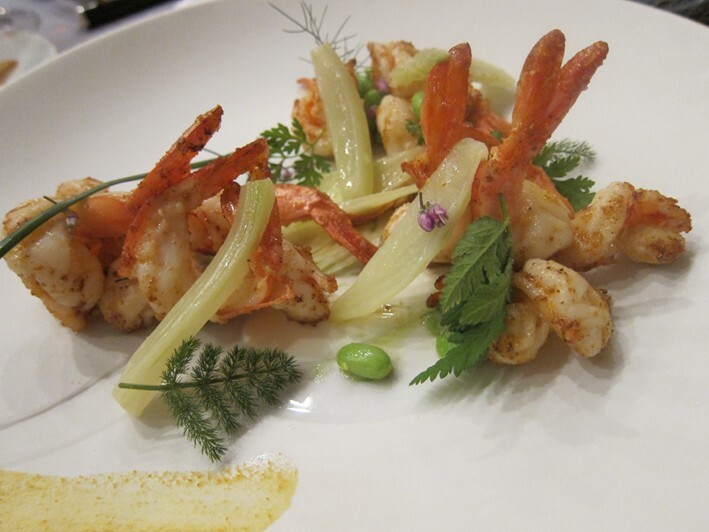 There was also a flower in the lily flower family with ecir cow cheese and wild garlic, which was enjoyable enough and pretty, and finally a lobster bouillon with celeriac puree and also a small local fish, where the lobster was the dominant flavour (17/20 average). The gargouillou today had 65 elements and is described in detail above. The version today had a few chanterelles as well as the array of usually vegetables and flowers. This is certainly a great dish, the quality of the vegetables being very high, but above all it is the blend of textures and flavours that really make this dish sing. Lesser copies that I have tried just taste like a regular salad with many elements, but here the care taken with each component is lifted by the judgment of which flavours and textures will work together well (20/20). The next dish was sea bass with chanterelles, bouquet of star anise and elderflower, garlic flowers and a dressing of tarragon. There was also an aromatic element called perfume de capucine. This fish was carefully cooked and thinly sliced, the mushrooms excellent (18/20). Duck foie gras was cooked a la plancha then in a water bath, a process which avoided caramelisation, which I am not sure is such a great idea since for me at least the caramelisation is part of the appeal of cooked foie gras. This came with a strongly flavoured puree of cauliflower laced with almond oil, along with a pair of cherries poached in vinegar. I didn’t think this worked that well, since the marzipan taste of the almonds was dominant, and the foie gras was surprisingly lacking in liver flavour. 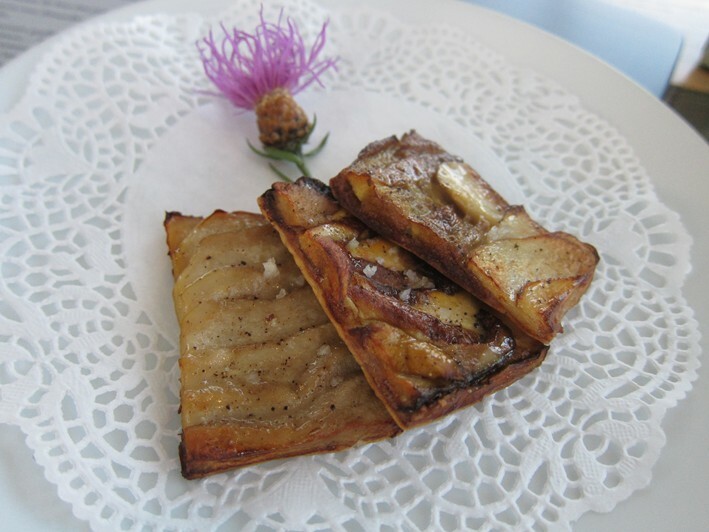 The vinegar was a logical way to balance the richness of the foie gras, but although pleasant it was not in the league of the earlier dishes (15/20). 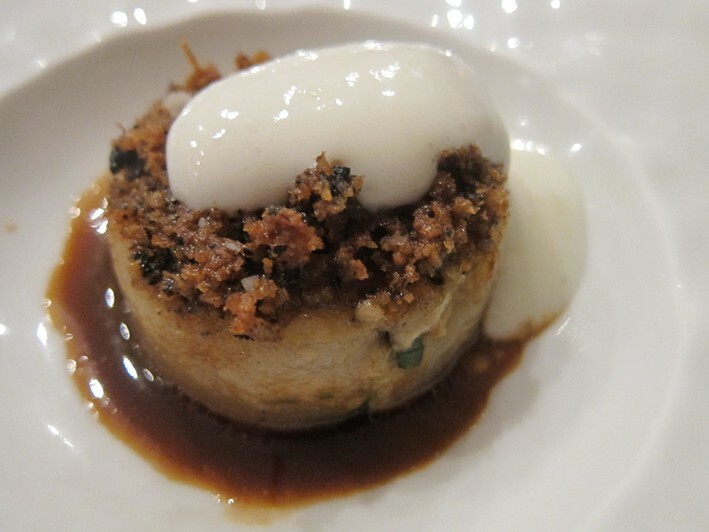 Next was a fermented cabbage tart with cabbage cream and summer truffle from Aveyron grated at the table. The pastry was excellent and I enjoyed the slight astringency of the pickling juices in the cabbage topping, which created a good balance (18/20). 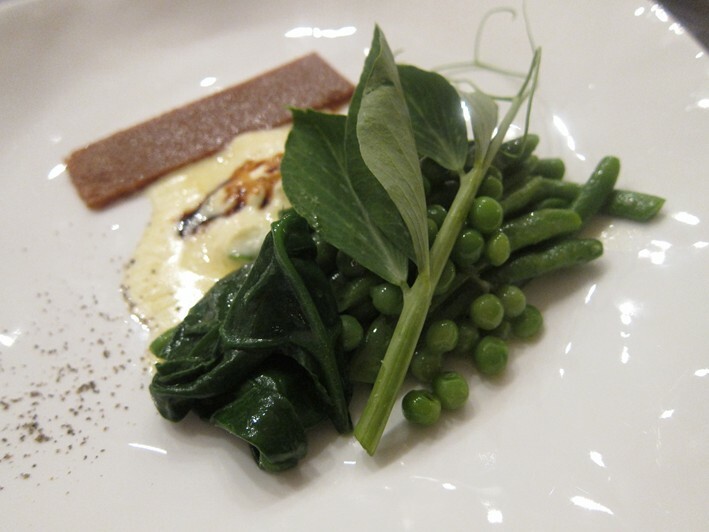 Beef from Aubrac came with beetroot and beef cream flavoured with liquorice, along with a vinegar reduction spiked with sugar, and a few peas and leaves. Between us we actually tried two different cuts of beef. The regular one was pleasant but in general the flavour of the local beef does not have the flavour of the very finest cattle. However there was another cut from the top of the rear leg called "mouvant”, which is an obscure cut. It is part of what is called a “round steak”, the other cuts being “plat de tranche” and “rond de tranche”, and seems to be the meat around the pectinius muscle (many thanks to butcher Jason Pleym for the explanation). This had excellent flavour and was surprisingly tender. The beetroot sauce was fine (17/20 for the dish). The cheese board here is filled with local cheeses, which were in good condition. We sampled a few desserts between us. 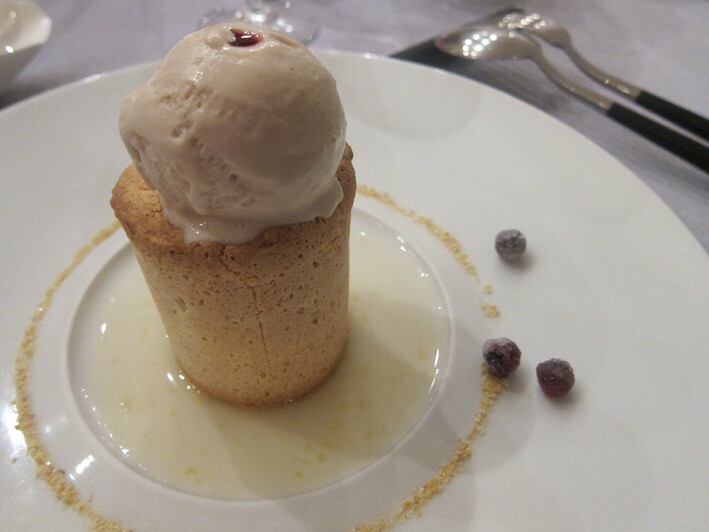 There was a biscuit with raspberry, red berries and elderflower with lemongrass ice cream and candied nuts. 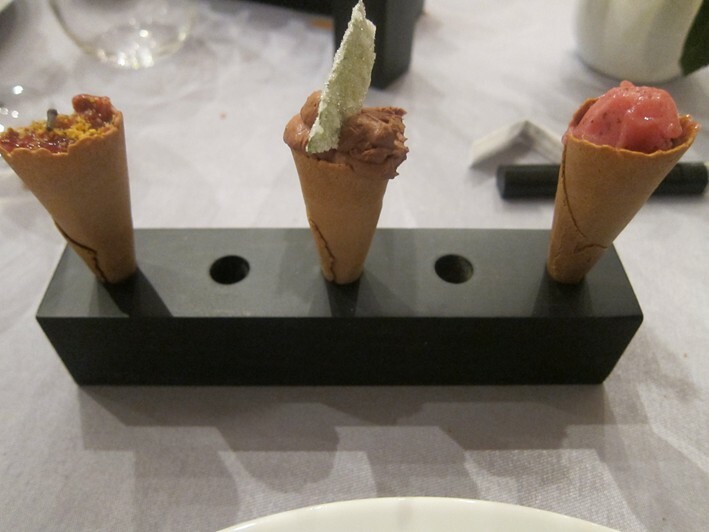 There was also confit rhubarb with strawberry, sorrel sorbet, cider confit and orange blossom mousse. I tried the classic chocolate coulant chocolate with balsamic sorbet and black truffle ice cream. “Coulant” just means “runny”, so is essentially a molten chocolate ganache in an almond flavoured biscuit. I would not have chosen balsamic sorbet but the chocolate itself was lovely (19/20). Service was charming, the staff friendly, attentive and very professional. I was being taken here by a friend so did not see the bill. However if you came here and chose the cheapest menu and shared a modest bottle of wine then you could get away for about £170. Of course if you opt for the longer menu and move up the wine list then you will pay more, potentially a lot more. 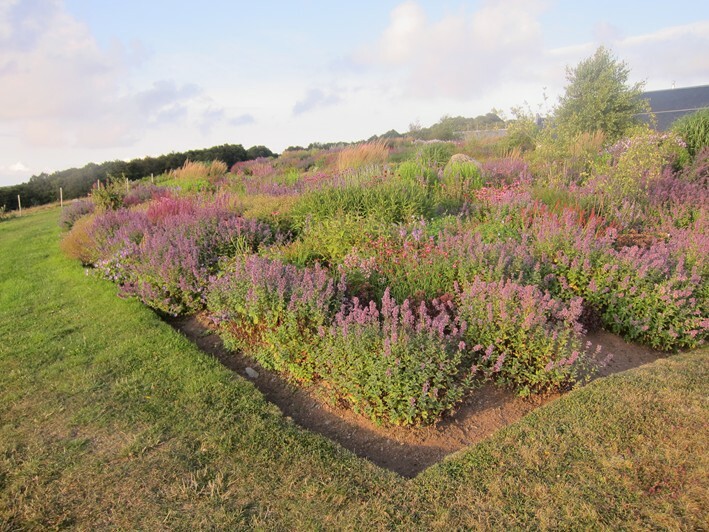 Overall it is a very enjoyable experience in a striking natural setting.